It is August in the Algarve but, for once, it is not so hot. The wind turbines refuse to swivel away from my house meaning that the north wind is blowing. Nonetheless, the beaches are rumpled with towels, surfboards, buckets and somersaulting umbrellas. People clutching sun hats queue outside restaurants, the camp sites look like refugee camps and hire cars, buses and camper vans with bike racks hog the roads. It is not a good time to travel. At least not in the camper van. But I decide it is a good time to revisit a very different type of journey to the ones that involve visiting other countries, seeing different places and trying not bash up the bike rack when reversing. 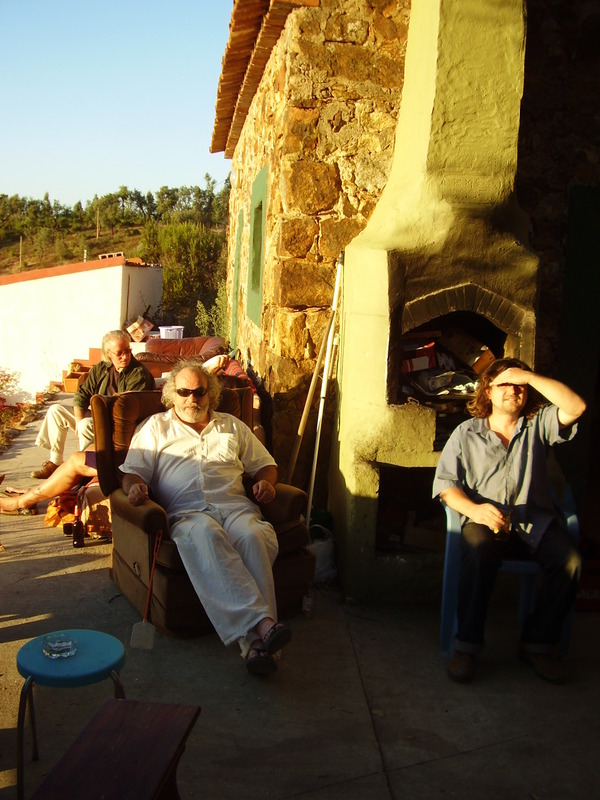 Three years ago in 2011 I was at a party in the Monchique mountains, a live band played and Eddie, the host, a charismatic Scot, dressed in an off-white kaftan and sandals, roasted chicken on a barbecue. People milled around outside drinking, laughing, dancing. The setting sun hovered on the horizon before slipping into the sea. 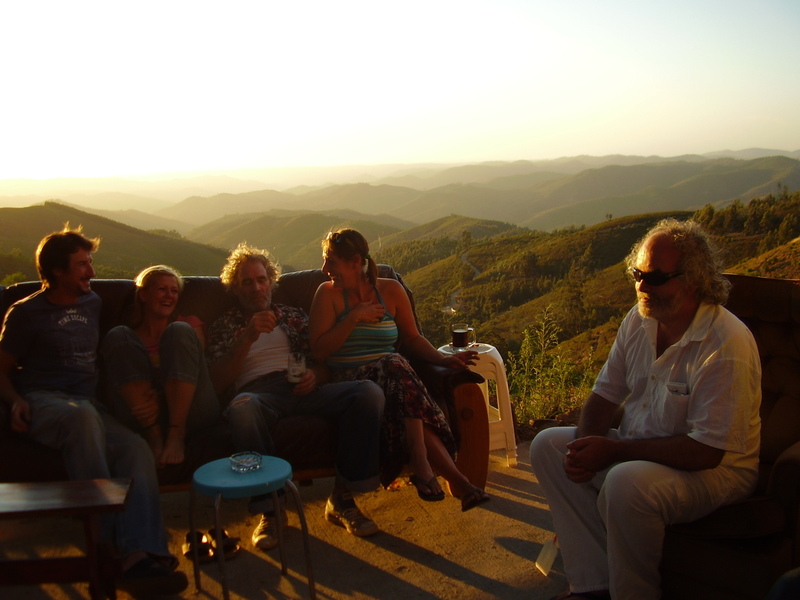 Medronha Jane filled up glasses with the local fire water from her hip flask. I clutched a glass of red wine chatting to Tanya, Eddie’s partner. I was there on my own. I tell her that I’d recently split up with Paul, the man I’d been seeing, because, well, it was complicated. ‘I mean she still has seventeen pairs of shoes in his wardrobe!’ I was talking about his wife. I decided that said it all and asked her about her life. I shoved the glass of red wine to my lips and held it there. I knew that people came to chat with Eddie. But, I assumed, they were people with problems. I knew that Eddie believed that in order to be happy we must be ourselves and like ourselves. I had used him as a model for one of my characters in a story in Beyond the Sea. But I didn’t have any problems any more. Besides, I’d once given Eddie a novel of mine to read, The Trials of Tricia Blake, a teenage novel about a young girl who does have problems at home, runs away to London, gets into all sorts of trouble and plans to murder her stepfather. Eddie’s verdict was, ‘It’s full of shite!’ and chuckled as if telling a private joke. Not the most constructive of critiques. Why would I want to talk to him? ‘But I’m fine,’ I squeaked. It was true. I’d had my crisis. My partner of twenty years had disappeared into the night shouting, ‘I’ve got my counselling, you should get yours!’ His counselling referred to the AA. A couple of painful days later, the department at the university where I’d taught for fifteen years turned to dust. I found myself in the mountains with little money, without a job and very alone. But that was more than two years ago. At the time of the party, I was back on track. I had three new online university teaching jobs, I was also teaching local writing workshops. My books were selling. Sort of. For the first time in my life I had some money. I had even decided I wanted to try to try to have a baby. I was in my forties: it was now or never. Everything was fine. Apart from the relationship. ‘I was just telling Lisa that she should see Eddie,’ Tanya yelled above Kraftwerk. Simon nodded. She’s a model and she’s looking good…. I wished I hadn’t mentioned the shoes. I shrugged and gulped my glass of Monsaraz. ‘Okay,’ I said. A week later, feeling strangely nervous, I meet up with Eddie. We walk up to Robbie’s house, carved into the mountain like a little cave. To the right of us the mountains merge into hills and cascade down to the coast. In the distance the sea glimmers in the afternoon sun. We both carry cups of tea. Mine slops as I slip on some gravel. As we get there, Eddie stops. I frown. What ‘jonny’? And how could my writing change? ‘How do you mean?’ I ask. Ah, I nod. ‘Journey’ – the non-travelling kind. But I really couldn’t see how my writing could change. After all, I know, more or less, the formula for writing fiction. I have been teaching it for twenty years. I’ve even written a book about it. I know, at least in theory, how to set scenes, create characters, structure plots. I know something about point of view, I know that without conflict there is no story. I know that the main character needs a quest – something that he or she wants, that this will lead to a crisis and that the character may or may not succeed in their objective. How could I undo all that knowledge? I nod again, still not convinced that it would be possible. And, if by some chance, my writing did change, maybe it would be for the better. After all, I wasn’t exactly on any bestselling lists. We sit down opposite each other on sofas covered with blankets in the little hobbit house in the hill. The concrete roof is covered over with earth and grass so from the top there is no indication that there is a little house below. The floor is painted iron oxide, warm and inviting. A table holds up a full ashtray and bits of ash cover its surface. A radio sings in the background – Debbie Harry’s, ‘Atomic’. Paintings cover the wall, gifts from talented friends. I sip my tea. Eddie is a dark shadow against the single pane and grubby window. His grey hair frizzes into the light of the window behind. He smiles and explains that jonny is about going back to the time when it was very confusing as a child. ‘It was for all of us.’ He tells me that a child always expects perfection and never gets it. Our parents have, mostly unwittingly, passed on all the shite from their lives. The result is confusion, chaos, uncertainty and conflict. How we deal with that is that we create blocks. And they remain with us for the rest of our lives. The aim of jonny is to take down those blocks. But also to know that it is not the parents’ fault. As they too were newborn babies and their parents filled them with shite. And so it’s gone on. Ad infinitum. I nod slowly. I knew plenty about confusion, chaos, uncertainty and conflict. That was the stuff of life surely and, certainly the stuff of fiction. Without conflict there is no story. Yes it made sense and yes I wanted to continue. I didn’t know it then but I was about to be gifted an extraordinary narrative: one which three years later I have finally decided to write about.